It was on a summer trip to visit my brother in the coastal mountains of Northern California that I first tried my beer on ice. 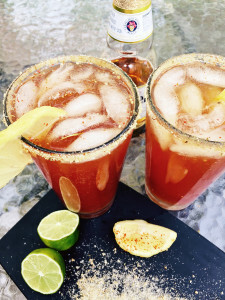 One day was looking to be particularly hot, so a plan was hatched to beat the heat with my brother’s summer drink of choice – Micheladas. I had doubt. My inner snark said: I am from the Northwest – I cut my teeth on strong hoppy micro beers! And he wanted me to try a beer over ice, a light beer over ice? But on that blazing summer afternoon when I gamely took a sip, I felt like I had just won a prize! My Michelada was served in a red plastic party cup with kosher salt on the rim and a slice of lime. With the ice and juice, it was lighter on alcohol (so you could have more! ), and it quenched the thirst and sated the body like no other summer cocktail. I was won over and had to learn the recipe for this tasty libation. When I asked how to make it I just got a list of ingredients and the message “es muy facile.” Try as I might it took a long time to recreate that perfection. I even went from using a glass to trying the red plastic cup again in case some how the secret was in the presentation. To further my search, I looked into the origins of this simple drink, and I encountered a story of valor comparable to Don Quixote and his noble fight with a windmill. Oral history, lore, and etymology blend together to create a richly textured story around such a humble drink. El General, Don Augusto Michel is the revered revolutionary General on the Mexican side that is said to have brought his troops to a cantina in the Mexican state of Son Louis Potosí. 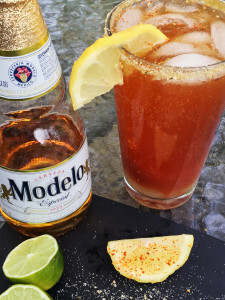 In cocktail lore, he created the drink, as he liked to add limón and picante sauce to his beer and is said to have offered this refreshment to his troops as means of nourishment and fortification after days of fighting. The Mexican Revolution started on November 20, 1910, based on a Manifest á la Nación called el Plan de San Luis Potosí. It is recognized as the first major political, social, and cultural revolution of the 20th century. So although I could find no specific military mention of him the likelihood that this cocktail hero is a true figure is great. There is another character in this story that has a more recent history. Often there is mention of Michel Ésper from San Louis Potosí in the 1940’s who frequented a bar that still exists in the town, which has the same name as the state, called Club Deportivo Potosino. It is here that he is said to have ordered his beer with lemon and salt. 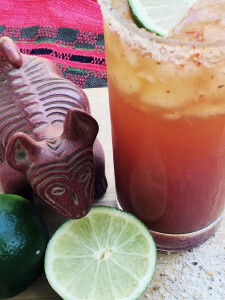 Today we call this drink a Chelada. During my research, I did not find references to either of these cocktail heroes luxuriously drinking their cervezas over ice but a closer look at the word Michelada says it all. Mi to mean mine, chela is said to be a slang word for beer, and helada icy, so there you have my beer icy, mi-chela-helada. My beer on ice! Rub the rim of a 16 oz. 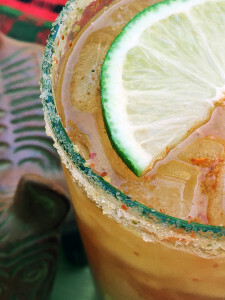 glass with a slice of lime and dip rim of the glass into rokz Citrus Jalapeno Margarita Salt. Fill the glass with crushed ice. Add the lime juice, and then add the next three ingredients. Finally, add the veggie juice and give it all a quick stir. Pour the beer over this icy mixture and let it mix itself from the carbonation. Garnish with a lime slice. You can serve this to a group by multiplying the ingredients per serving and mixing everything but the beer into a pitcher. 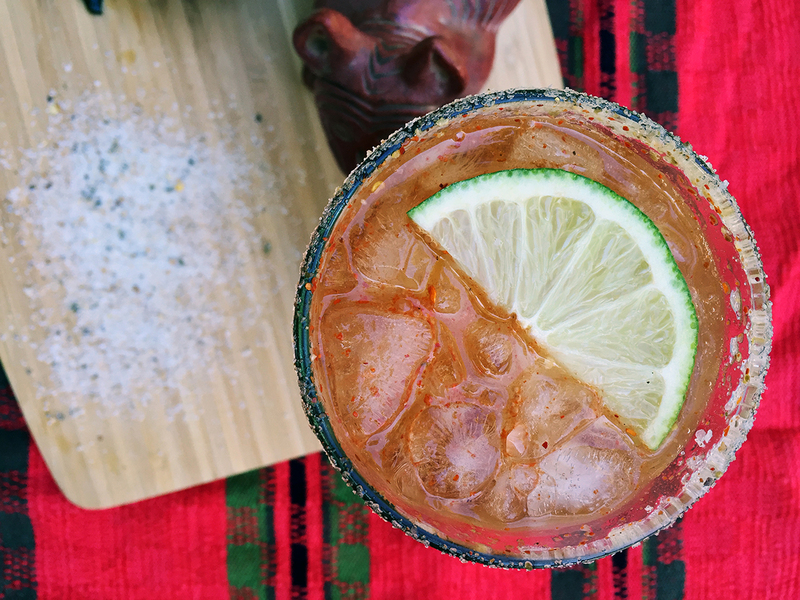 Serve with an ice bucket, cold cervezas, sliced limes, and a plate of Citrus Jalapeño Margarita Salt from rokz. You can put out glasses for serving on a table, or get real simple and use those good old red party cups; it will refresh either way! –¡Comer con gusto!